Got an invite from a guy i went to school with about a proposed trail from Rocky Mountain House to Nordegg. Their is a group dedicated to it on facebook and the plans so far will not allow for fullsize 4x4s to be permitted on the trail. I think that this is unfair since im sure the vast majority of us on this site would like to use a trail like this for recreational use and also to prove that people with 4x4s are not damaging the environment, rather only a select few damage trails. How many time have people been out in the Jeeps and seen people quadding while drinking and druk and people who dont care to research anyhing will let them on this trail but the responsible ones among us arent allowed to use this trail because of something we havent done. I think that if people want to be able to use this trail they should join this group and make their voice heard so that all of the trails will not be closed down on day. It will be a lot easier to keep trails open if we show some initiative and interest to keep them open. Me alone saying anything will mean nothing to these people but if a large group of people propose that this be changed that will be the only way things will ever change. I moved your topic here, as it fits here the best. I also deleted your other cross-posts, so that in the future a search for....say....Nordegg....won't bring up those three posts, of which only this one really had any info. Anyway...."proposed" trail? Does this mean they are planning to create a trail, or change a present trail? Plus, a link to the Facebook site would be great. My thoughts have been posted on their page. What Ive got from it is that they are linking existing trails together to for a continuos trail judging from the pic on thier site. I had something on there, but then removed it, as I wasn't sure how to word it. I don't want to come off as being one-sided for 4x4's and against everyone else by playing the blame game....it's a tricky line to cross. TANK, saw your comments, and they were good. Being a quadder and a jeeper helps to alleviate the problem I mentioned. Unfortunately as much as I hate to admit it I do think that it would be better to ban all vehicular traffic like tank suggested. And like Darcy said nice having a quadder also so they get more perspective. I've quaded on these trails quite a bit and the gourges arent to bad for quads but if you get someone whos not real sure how to wheel, they might have a difficult time, it may even be hard for people with experiance. It would be a fun trail. Supporters of such a trail might look up the history of one Ernest Ross. 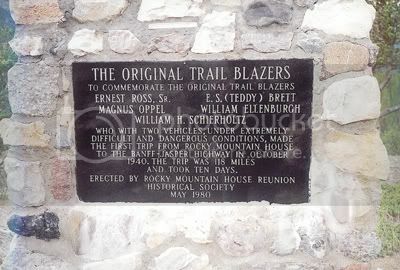 There's a mountain named after him on the Kootenay Plains past Cline River (which is marked from the highway), and a cairn to his expedition which you would have to know the location to find. I can post more on the details when time permits but my point is there's a historical precedence for such an undertaking.